Water filters to remove lead won’t be installed Monday at Homer A. Plessy Community School despite the Orleans Parish school district announcing it would do so last week after a 13-year-old conducted an off-the-shelf water contaminant test. 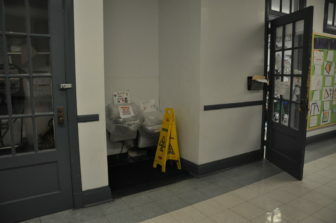 That’s because the school needs equipment — called booster pumps — to ensure that water pressure is maintained in drinking fountains after the filters are installed, Plessy Principal Meghan Raychaudhuri told The Lens. Raychaudhuri said the district’s contractor was on site first thing Monday morning. But they couldn’t install filters, she explained in a Monday afternoon letter to parents. Meanwhile, plastic bags will still cover the historic school’s drinking fountains. Raychaudhuri said the district is providing bottled water to students. “Due to low water pressure in the building, we were unable to install water filtration systems this morning at Plessy School as planned,” district spokeswoman Ambria Washington said in a statement Monday. “However, OPSB delivered more than 2,000 water bottles at the school today and will continue to make sure students have access to drinkable water as we work to install those water filtration systems as a precaution.” . The need for booster pumps adds yet another complication to the district’s yearslong project to protect students from exposure to lead in water. The district doesn’t know if it has a lead-in-water problem. But after the health crisis over lead in Flint, Michigan’s water supply became public, the Recovery School District and Orleans Parish School board promised to test the water in 2016. That never happened. They decided installing filters was a more permanent solution, but it’s been a slow process. The French Quarter school is not the only New Orleans public school that will need the booster pumps. Crescent City Schools’ Operations Crescent Director Chris Hines said one of its charters, Akili Academy of New Orleans, located in the William Frantz Elementary School, has filters, but they don’t appear to be connected yet. He said he knows they need the booster pumps at a few of the school’s fountains. He said the district hasn’t installed them yet. He believed they were waiting to test the booster pumps at another school in the city. Last week, Washington confirmed the need for the pumps at some schools. “These booster pumps will help create an adequate flow of drinking water after the filtration process,” she wrote in a March 25 email. Washington didn’t respond to an email inquiring which schools were on that list. “We’ve placed an emergency order for booster pumps which are needed in order to fully install filtration systems in school buildings with low water pressure,” she wrote on Monday. This story was updated with a statement from the Orleans Parish school district.